I recently heard a mother saying that she feared her son would be over-confident. She went on to say that she constantly bragged on her son, and was afraid it would go to his head. This gave me something to ponder. See, we, my husband and I, always tell my son how great he is… whether it’s in school related matters or as a budding actor — he performs regularly at our local children’s theater — we build his confidence. Yes, I say “build” his confidence. Don’t get me wrong… he works hard. We have instilled in him how important it is to give 100%, and to study and be prepared. Because like we tell him, we know how wonderful he is, but for the rest of the world to know, he must work hard. I think this is the main reason he is so confident. He knows he has worked hard at whatever it is he is doing, whether it’s a math test, the spelling bee, or a speech contest he is participating in, so he feels confident in his success. The confidence building that goes on in our family is targeted towards the mental, emotional, and social aspects of his life. Yes, I tell him his handsome, but the physical isn’t important. He is ten and already knows that who a person is on the inside is what counts. Yet, we do encourage a confident smile. A person’s smile is important. It is how we express positivity. It shows friendliness and kindness. It lets people know we are happy. So my son knows that his inner confidence shows through his smile. And that taking care of his teeth… having good oral hygiene is important for a confident smile. One way he does that is by using ACT Anticavity Kids. It tastes good so he doesn’t mind rinsing with it. And I’m “confident” he has healthier teeth. Every morning, he rinses with ACT Kids before leaving for school. It’s a routine that helps him start off his day with a bright, healthy, and confident smile. How do you build confidence in your kids? 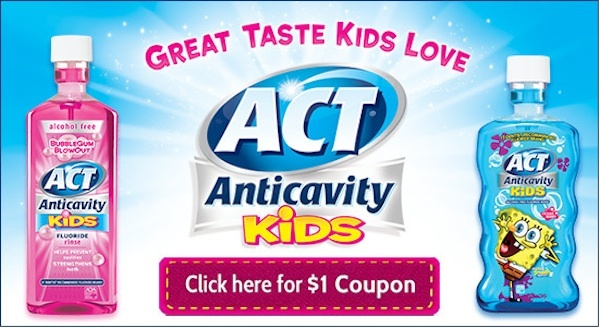 Be sure to click on the image at the top for your $1 off coupon on your next bottle of ACT Kids. Disclosure: I was compensated for this blog post while participating in the SocialMoms and ACT Kids blogging program. The opinions and ideas expressed here are my own. To read more posts on this topic, click here. I tell my kids how awesome they are, because it’s true! I love that they are working so hard to boost confidence in children. I also love to save money, so definitely will be taking advantage of that coupon. I constantly tell my kids something good about them. For instance how smart they are or cute and how proud I am of them. It makes a huge difference in their self esteem. I can’t wait until Goo stops swallowing and learns to rinse only. LOL! I’m always telling my kids that they are fabulous, mainly because it’s true! Love a great smile! Thanks for the coupon! I agree. I love that they are working to boost children’s confidence. I’ll have to talk about your post with my son as we’re having trouble getting him to brush his teeth properly. Your son has such a great smile! What a great thing they are doing boosting kids confidence. we love the ACT mouthwashes for kids.